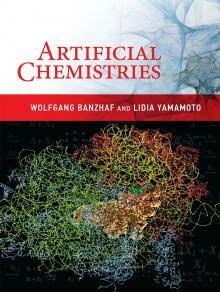 Artificial-Chemistries.org is the website accompanying the book "Artificial Chemistries" by Wolfgang Banzhaf and Lidia Yamamoto, MIT Press, 2015, 571 pages. It contains PyCellChemistry, a software tool for the design and development of Artificial Chemistries and for the exploration of their behavior, including pre-programmed and hands-on examples. It will also hold news, resources, updates, and eventual corrections to the book, as these arise. September 2015: version 2.0 is out with reaction-diffusion as an example of spatial AC. Artificial Chemistries (ACs) [Dittrich2001] are man-made virtual or physical systems where objects are transformed in interactions, like molecules in chemical reactions. The field of Artificial Chemistries started as spin-off of Artificial Life, motivated by a desire to pinpoint and understand the emergent phenomena driving the transition from nonliving to living matter, and to create new forms of synthetic life from the bottom up, in vitro or in silico. An artificial chemistry is defined by a tuple (S,R,A) where S is the set of possible molecular species in the system, R is the set of possible chemical reactions among them, and A is an algorithm that simulates the dynamics of the molecular interactions, such as motions, collisions, and state transformations in reactions. Why are Artificial Chemistries important? This is only the top of the iceberg. We believe that artificial chemistries are just starting to show their true potential. We hope that our book and software package will help bringing more beginners to the field, who will contribute with fresh ideas and novel applications. a new algorithm to find the organizations in a system, with software, corresponding paper, and video. Practical Computing for Biologists, book by Haddock and Dunn: Unix command line, regular expressions, python programming. NumPy: a numeric package including vectors, matrices, random number generators, and many other functions. SciPy: a comprehensive collection of mathematical packages for Python, including NumPy, Matplotlib, and others. Overview of Graphical User Interface (GUI) support in Python: frameworks, FAQ.